The other day, I came across a recipe for turmeric sugar cookies on Food52. I loved the idea of brightening cookie dough with turmeric, an earthy, orange-hued spice used in savory cooking throughout the Middle East and South Asia. So I developed a recipe of my own. Turmeric pairs naturally with its cousin, ginger. 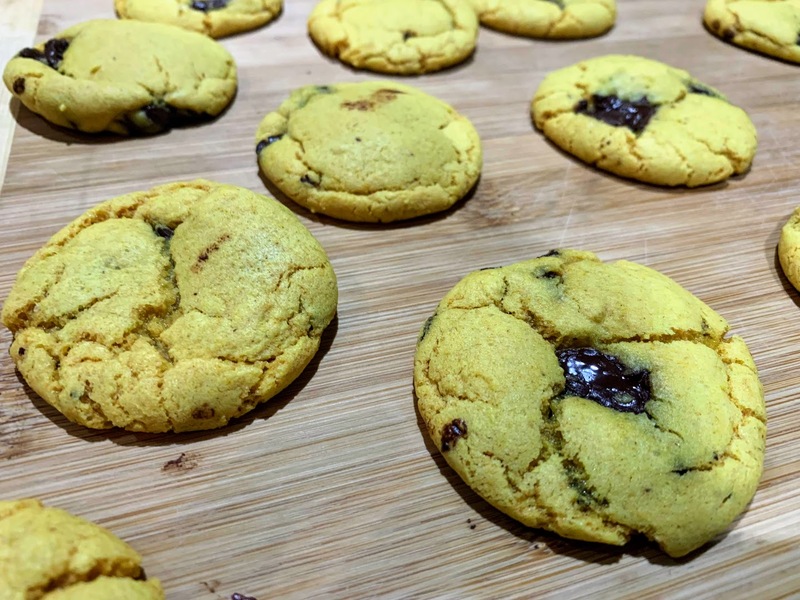 Using that flavor combination as a starting point, I added loads of ground ginger (fresh ginger loses much of its flavor in the oven) and threw in dark chocolate chunks, my all-time favorite addition to cookie dough, which happens to nicely complement the ginger. The first batch was too buttery, so the second time I made these, I replaced some of the butter with Greek yogurt. (See note below.) The resulting texture was just the right combination of soft, fluffy, light, and chewy. Note: A general tip for substituting Greek yogurt: replace half the butter in a recipe with half the amount of Greek yogurt. For example, one cup of butter can be replaced by 1/2 cup butter plus 1/4 cup Greek yogurt. Preheat oven to 350 degrees F and line a baking sheet with parchment paper. In a small bowl, sift together flour, baking powder, baking soda, salt, turmeric, and ginger. Set aside. In a large bowl, mix butter, sugar, and Greek yogurt until light and fluffy. Stir in egg until smooth. Add dry ingredients, mixing until just combined. Add dark chocolate chunks. Roll tablespoons of dough into balls, and place around an inch apart on prepared baking sheet. Bake for around 12 minutes, until cracks form on the surfaces and bottoms just begin to turn golden brown. 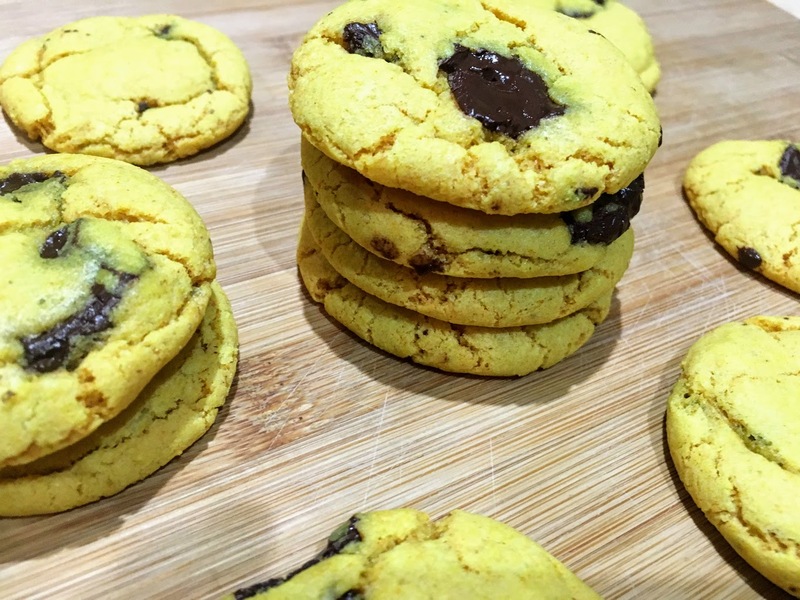 Allow to cool directly on baking sheet; the cookies may not appear ready when you first remove them from the oven, but will continue to cook as they cool. Store in an airtight container at room temperature.